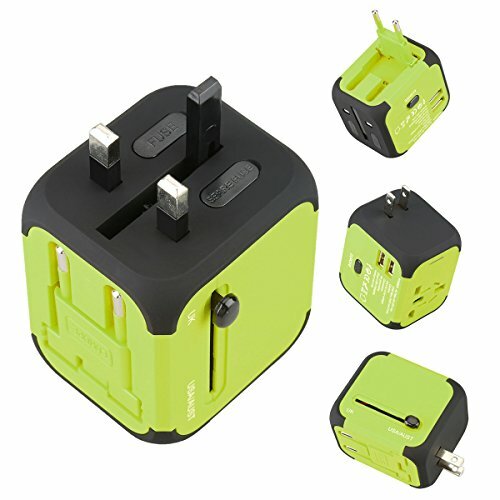 FIRST TIME IN A NEW COUNTRY HERE'S YOUR SOLUTION All-in-One World Travel Adapter The Wootrip Adapter is built with 4 different plug standards: Type US Used in: North and Central America, Japan, etc. Type EU Used in: Europe, with the exception of the UK, Ireland, Cyprus and Malta. Type UK Used in: UK, Ireland, Cyprus, Malta, Malaysia, Singapore, Hong Kong, etc. Type AU Used in: Australia, China, New Zealand, Papua New Guinea, Argentina, etc. Universal AC Socket with 8 pin plug and Powerful Intelligent Dual USB Charging Ports Manufactured from Fire Resistant PC Materials, built-in Spare Fuse, Safety Shutters, LED, Sliders and Safety Plug Lock Designed with industry leading Premium Materials ROHS, CE & FC Certified PROTECTION FEATURE Over-Current Protection Short-Circuit Protection OverTemperature Protection HOW TO USE THE ADAPTER 1.Make sure all sliders are placed securely into their closed position.Please slide back other plugs when use one plug. 2.Use the plug control switch to choose different plug types,then slide the corresponding plug from the side. 3.Connect the appliance to the adapter. 4.Plug the adapter into wall socket. 5.Use the release button to retract the plugs NOTE: This adapter DOES NOT convert voltage through its AC socket. This adapter is not suitable for high power, such as Hair dryer, Straightener, Flattening Iron/Hair Curlers, Water heater or other appliances that require over 1380 Watts.